When I first heard the words on WTOP late this afternoon--I Nearly Drove Off The Side Of The Road. 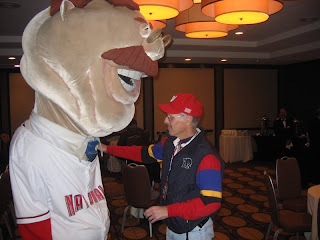 Then, I hurried home to find out that Bill Ladson at Nationals.com had broke the story. Finally, at 5:35PM, Our Washington Nationals confirmed everything. "The Most Thrilling Closer In The Game" was No Longer A Washington National. "Hail To The Chief" would no longer be played again in the 9th Inning of any home ballgame. Chad Cordero had declined an assignment to The Minor Leagues and had elected Free Agency. Our Now Former Number 32, with The GREAT Flat Brim Cap, may never trot out for one of his "Chief Cardiologist" Saves Again. First thought: How am I going to break the news to The African Queen? She loves "The Chief". To say "adore" would be an understatement. Many Fans of Our Washington Nationals may live on every Win and every Loss, but as much as Sohna wants to see DC's Team win each and every game, she just as much wants to see Quality Personalities. And Chad Cordero is one of the VERY BEST. Off & On The Field Of Play, this young man has The Right Stuff. Chad showed up for every Charity Event in Washington. And he has spent his own time, and money, to help others. That Fact is well documented on Nats320 and should never be understated. Yeah, we both knew that Chad Cordero was going to be Non-Tendered by Our General Manager Jim Bowden. The Flap over that incident is well known. But as is always the case, AS A FAN, you can only WISH everything turns out for the better. 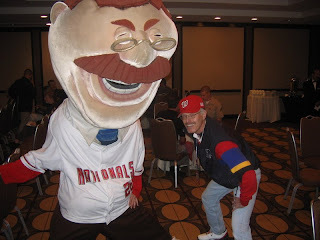 We can only hope that "The Chief" returns healthy donning a Nationals' Uniform, once again. But, as A Fan, we don't control the roster moves. And as Sohna and I have come to learn over the past four years since Baseball Returned to The Nation's Capital--Major League Baseball Is A BIG BUSINESS. Deserved Opportunity, Or Not, does not always factor into the final team decison. So sadly today, arguably, The Most Popular Face of Our Washington Nationals, not named Ryan Zimmerman--and you could debate "The Chief" has more fans--is no longer a member of Our Team. Yes, I know, The Baseball Operation's Decision has merit. But it still hurts. It really does. The losing of a beloved player is the HARDEST PART OF BEING A FAN. When you spend so much time getting ATTACHED to A Player, it is very hard to see one go. That is why it became very important to get in touch with Chad Cordero this evening to see if he would talk to us about his, in essence, newly found Free Agency. As always, it takes a little creativity for that to happen on our part. Fortunately, it did. A few phone calls later this evening, Chad Cordero spoke to me from his home in Southern California. For 20 Minutes we chatted about today's announced decision, his recovery from shoulder surgery (torn labrum) and what is in store for his future as a Major League Player. Gracious as always to The African Queen & I--he answered every single question I pondered. With that, here we go with My Conversation With Chad Cordero. Final question—and it’s not too tough. I know you are engaged (to Jamie), is the date anytime soon? You know, this is the hardest thing about being a fan--seeing the players go away--leaving Our Team. With that, Chad Cordero and I bid adieu. Our Impromptu Conversation Had Concluded. The African Queen and I can only wish him the very, very best. Because, when Our Washington Nationals have been at their very best--"The Most Thrilling Closer In The Game" has many times led the way. More importantly, Our Former Number 32 is a Stand Up Guy. Win or Lose, he stood at his locker every single night to face the music (from the media). And for me, I will be forever grateful. Every single time he ran into The African Queen he stopped to say hello, no matter how rushed he was. "The Most Thrilling Closer In The Game" is a Professional and we will always remember Chad Cordero for his assistance in helping to bring Baseball Back To Washington, DC. As far as Sohna and I are concerned--we can induct Chad Cordero as the first member of Our Washington Nationals Hall of Fame--right now. We mean it. He deserves it, because he earned it with his honest efforts. There is no question, "The Chief" is a wonderful young man. Good Luck To You--Chad Cordero. May your Big League Career continue for many successful seasons. PS--That interview was totally off the cuff. I had no planned questions. Chad and I just talked for 20 minutes. Our Washington Nationals sent out a press release this afternoon confirming November 6th at 12Noon for the New Jersey & Uniform Unveilings at The ESPN Zone in Washington, DC. Our Manager Manny Acta, along with Lastings Milledge and Elijah Dukes will join in the festivities. As usual, Radio Broadcaster Charlie Slowes will Host The Ceremony. WHAT: The Washington Nationals will unveil their new 2009 regular-season jerseys at the ESPN Zone on Thursday, November 6 at 12:00pm. Nationals Manager Manny Acta and outfielders Elijah Dukes and Lastings Milledge will take part in the event, moderated by radio broadcaster Charlie Slowes. Following the program, Acta, Dukes and Milledge will participate in a 30-minute autograph session. The event is open to the public and the first 50 guests to arrive will receive a Nationals promotional item at the conclusion of the event. The jerseys will be available for purchase exclusively at the Nationals Park Team Store, located on Half Street Southeast in the ballpark’s Center Field Plaza, Thursday, November 6 through Sunday, November 9. 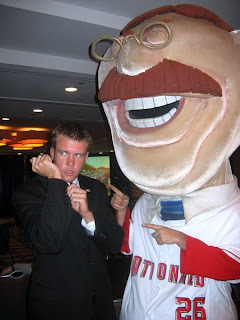 This is The 1000th Post in The History Of The Nats320 Blog. How fitting the subject matter is an interview. They may well be just a "Third Year" Expansion Team, as Phil Wood stated in yesterday's post, but they are still Our Washington Nationals. And they have a Fan Base always curious about the next move, or moves, Our General Manager Jim Bowden may make over the course of this upcoming off season--in rebuilding Our Franchise. Staying on the same subject line of possible roster moves as we ended Part One, Phil and I continue our chat discussing what trades might be possible this winter. With that, here we go with Part Two of My Conversation With Phil Wood. “Then, ‘it must have been because they were too cheap! !’ Cheap didn’t have anything to do with it. It’s one of those things where perception is reality and people perceive them to be bad because they perceive Washington to be bad. The whole issue of ‘nobody went to the games!’ I don’t know about that, nearly 2.4 Million people seems fairly decent to me. And a big part of that was the horrible marketing job that the club did. All we heard last off-season was there was not going to be any parking. You will not be able to park there, so you will have to take the subway or not go. A lot of people who make their season’s plans based upon that are going to say: 'We are not going to those things because there is no place to park.' That killed them." "I'd say it's been a financial benefit to the Nationals, but still too many people seem to have a problem finding the game when it's on MASN 2. I think the ratings have been terribly skewed because of that. It simply doesn't make sense that you could have 29,000 people in the park and only 9,000 watching on TV." With that final answer, My Conversation With Phil Wood about Our Washington Nationals concluded. Yet, we are not done--not by a long shot. Talking about the current state of Major League Baseball in Washington, DC was just half our chat. As I mentioned yesterday, Phil Wood is considered one of the foremost authorities on The History Of Washington Baseball. He grew up in D.C. during the waning years of The Original Senators--before they moved to Minnesota and became The Twins. And he lived and died, as only a young fan could, through all 11 Seasons of The Expansion Senators--now The Texas Rangers. For a good 45 minutes we had a wonderful conversation about Our Beloved Lost Ball Clubs. That Two Parter coming this weekend to The Nats320 Blog. He's been called Washington's Pre-eminant On-Air Baseball Authority. Some would say Baseball Historian. Phil Wood has dedicated his Professional Career to his love of Baseball, and Major League Baseball in Washington, DC in particular. Yes, Phil grew up in The 1950's a Washington Senators Fan, in Old Griffith Stadium. A DC Native, he followed his beloved Nats through all their trials and tribulations--from The Days of Mickey Vernon and Harmon Killebrew to those last days of Frank Howard and Ted Williams in 1971. He has always maintained his love for Major League Baseball in The Nation's Capital. Now, 50 Years after his love affair with DC Baseball began, Phil Wood still finds himself covering Washington's newest re-entry to Big League Ball--Our Washington Nationals. 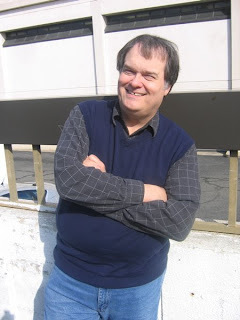 As a Columnist for The DC Examiner, Regular Contributor to MASN's Nats Extra and his weekly radio show now heard on WJFK--Baltimore's 1300AM each Saturday, Phil Wood continues to pass on his vast knowledge of The Great Game. Who better than to truly get the off season going on Nats320 than to sit down and chat with Phil Wood. Who doesn't want to talk baseball with this nice man? We had met twice previously, although we didn't really know each other. But we both knew we share a love of Washington Baseball. 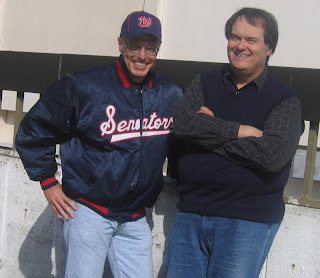 Recently, I contacted Phil to see if he might have time to discuss not only Our Washington Nationals, but his experiences and joys of the now Long Gone--Washington Senators. Phil Wood readily agreed and we met last Thursday for an extended lunch in Arlington, Virginia. First up will be a two parter on Our Washington Nationals. The Current State of Our Team and the direction it's heading. I think we covered it all, including The Media Coverage. Then, later a mesmerizing 45 Minute discussion on The Washington Senators. Phil will talk about his experiences at Griffith Stadium, DC & RFK Stadium and his many encounters with some of DC's Greatest and Not So Great Players. He may maintain the greatest collection of Washington DC Baseball Memorabilia in a private collection. It's a great read for anyone that loves The History Of The Game. There is alot to cover, so with that, here we go with Part One of My Conversation With Phil Wood on Our Washington Nationals. With that answer, Part One of My Conversation With Phil Wood ends. Tomorrow, in Part Two, Phil and I will continue to chat about The Upcoming Off Season, which Players currently in our system are Key to Our Near Future Development, some interesting thoughts about Our Manager Manny Acta and some insight into Media Coverage of Our Washington Nationals, among other topics. All that upcoming in Part Two Of My Conversation With Phil Wood. Maybe after completing The 33rd Marine Corps Marathon yesterday, "Teddy" can be the first patient for Our Washington Nationals New Team Medical Director. Dr. Wiemi Douoguih would have quite the specimen to work with to begin his new career journey. 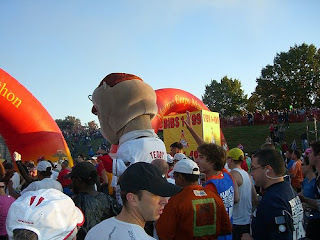 Either way, "Teddy" was quite the persona Sunday on the race course, and thanks to USCDERRICK and Our Washington Nationals, a few more pictures of Teddy at The Marine Corps Marathon were sent my way late this afternoon. Now I am digging the RED Socks and Black Running Shoes. Enjoy!! 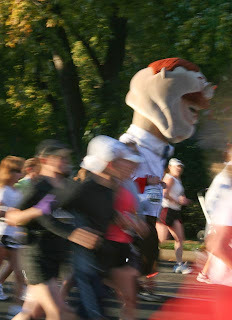 According to The Marine Corps Marathon Official Website, (Search Race Bib #28796) "TEDDY" finished in 17,917th Place in The 33rd Running of The Marine Corps Marathon. 18,261 Runners Finished Today's Historic Race. Out of 11,120 Male Runners, Teddy Finished in 10,940th Place. Any way you look at it, he did surprisingly well. And Thanks to Our Good Friend, Janet Wamsley, there are pictures to prove it. 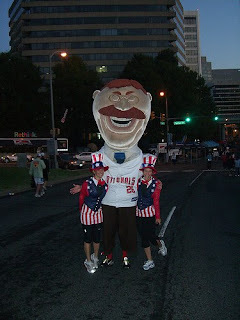 "Teddy" running Sunday Morning through Arlington, Virginia and The District of Columbia. I know it's hard to believe, but "Teddy" DIDN'T Finish Last. I am expecting some more pictures from some other friends, I could not attend the event as I am back out on The Presidential Campaign, but when I receive them, I will certainly post them up. 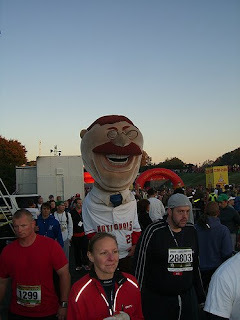 Many, Many Thanks To Janet Wamsley for sharing her nice pictures of "Teddy" running The 33rd Marine Corps Marathon. Janet, your effort is very much appreciated by Sohna and I. According to The ESPN Zone in Washington, DC, they will host The Official Unveiling of Our Washington Nationals New Uniforms. Thursday, November 6th at 12PM at their 12th and E Streets NW Location. Washington Players attending to be announced later. In the past, Radio Broadcaster Charlie Slowes has always hosted. No Official Word From The Team Though. We have Internet service problems in our neighborhood right now. Sohna and I are actually surfing the web on DIAL-UP. I can't tell you how ancient it seems. Hopefully, this will be solved by the weekend. We can only hope!! In the meantime our access is a little slow right now. I was told he will run the entire race--all 26.2 Miles of it. 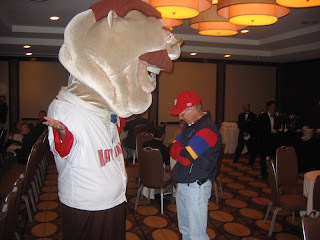 So, while Our Washington Nationals were announcing their new Coaching Staff for 2009, I found myself at The Capitol Hill Hyatt on New Jersey Avenue, NW trying to coach some sense into "Teddy". 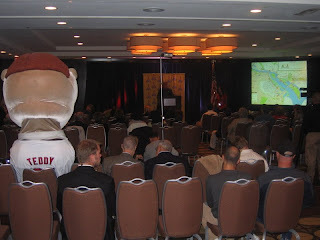 You see, as was reported yesterday, Our Lovable Loser is posting up for The 33rd Running of The Marine Corp Marathon this Sunday and "Teddy" was on hand at today's Press Conference to help hype the event. But as we all have come to learn, understanding the concept of "RACING" has not exactly been "Teddy's" Forte. Of course that has never waned his popularity. "Teddy" showed up with his Secret Service Protection in tow this morning and immediately set off to the podium and the microphone for the obligatory Photo Op. What A Politician!! They Never Forget What's Important. A few "Bully, Bullies" later, Our Lovable Loser and I got together for a little strategy session. Yes, it was time to find out if "Teddy" Gets It. Followed by an in-depth conversation about The Concept Of A Race. 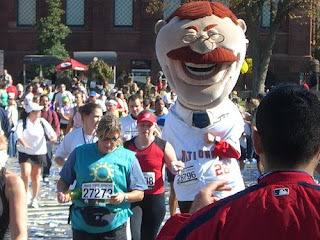 How Teddy should run "The People's Marathon" on October 26th. For a while it looked like he understood and was getting into the possibilities. Unfortunately, once the lessons were complete--it was clear--"Teddy" had no idea what I was talking about. 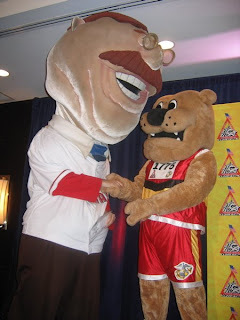 That being said--"Teddy" was pumped when he received his Race Number for The Marine Corp Marathon--Number 28796--from "Miles"--The Marine Corp Marathon Mascot. So, the big question tonight? Will "Teddy" Go-All-The-Way, or will #28796 Fail To Cross The Finish Line after 26.2 Miles this coming Sunday, October 26th for The 33rd Running of The Marine Corp Marathon. I tried to "Coach 'Em Up", but it's hard to say whether "Teddy" will ever get it? 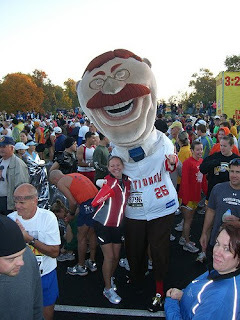 Our Lovable Loser--"Teddy"--has apparently committed to running The 33rd Annual Marine Corp Marathon this Sunday on the eve of Teddy Roosevelt's 150th Birthday. Now that should be the sight!!! Will "Teddy" use a Segway, a Motorbike, or some other contraption to lap the field? Will The Strict To Form Marines Put Up With His Antics? 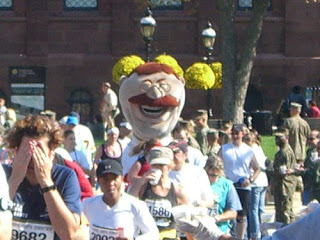 It's a Good Idea and the pictures of "Teddy" RUNNING The Marine Corp Marathon should be pretty good. WHAT: Washington Nationals Racing President Teddy will participate in the 33rd Annual Marine Corps Marathon on Sunday, October 26 at 8:00am. 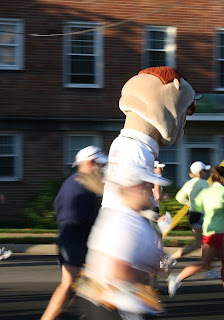 On the eve of his 150th birthday, Teddy will compete in the race known as “The People’s Marathon” with the hope of showing everyone that it is not about winning or losing, but it is about finishing the race. Teddy will also appear at the Marine Corps Marathon Press Conference on Friday, October 24 in support of all race participants. 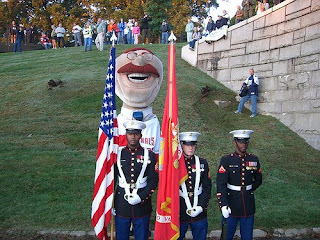 For more information on the Marine Corps Marathon, please visit www.marinemarathon.com. Media interested in attending Sunday’s race must be credentialed. Heading home from covering Barack Obama's appearance in Leesburg this afternoon, I received a text message from a friend of mine pondering whether I was listening to Jim Bowden on the radio? Having no idea what he was talking about, I replied where? Apparently tonight on WFED, 1500 AM beginning at 7PM, Byron Kerr hosted a Special World Series Edition of Nationals Insider. Our General Manager Jim Bowden was on the program for the full hour answering questions. Also, Radio Broadcaster Charlie Slowes, Assistant General Manager Bob Boone and Reliever Joel Hanrahan joined them for parts of the program for interviews. Picking up the conversation 15 minutes into the broadcast, I quickly wrote down and paraphrased some of the more interesting comments I heard. If you happened to listen to the first 15 minutes, please chime in with some additional comments. I would love to know what else was said. He said he's recovering fine from his recent cancer scare. JimBo also said that agreements are in place for most of the 2009 Coaching Staff, but no official announcement will take place until everyone's contracts and deals are completed. John Lannan and Jordan Zimmermann advanced the most this past season in growing as Professional Pitchers. If you are trying to win--you can't have untouchables (on your roster)--if you want to win. Anytime you have a chance to add a number one or number two starter via trade--you have to do it (make a trade--even if it means giving up someone special in your system). On Elijah Dukes--had one of the best RBI's Per At-Bat Stats in the game. Came along way at the plate this past season. Has tremendous potential and is improving off the field as well. A lot of people are rooting for him to succeed. Are you in the market for a Power Hitting First Baseman or Outfielder? We are looking for a four hole hitter, preferably lefthanded, but we are not going to be picky about position. Talking to Cubs Manager Lou Piniella earlier in the day, Lou mentioned to Jim how Chicago is also looking for a left handed power bat this off season because The Cubs were exposed this off season with their right handed dominated batting order. So getting a power lefty is important, more so than position. We are open to all types of discussions this winter. We have already started trade discussions. 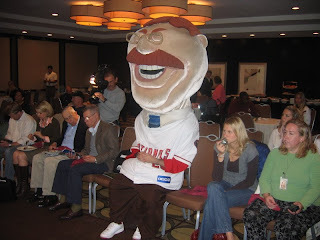 Normally all this comes to a head, ending up at The Winter Meetings in Las Vegas. We will be active. On Joel Hanrahan--Joel did a terrific job this year. He has a 97 MPH Fastball and unhittable slider. He just blew some batters away. When you have that dominating stuff, there is no reason to not develop into an outstanding closer. You are going to see this pitcher get better and better. No one has the raw stuff this guy has. He's going to be good for a long, long time. On Ryan Zimmerman's Contract Extension--We will work together to get a long term deal with his agents. It’s going to happen. There is no doubt about that from both sides. Zimmerman is here for the long term. We are going to continue to work hard for a long term deal and we will get it done, count on it. On first base with Nick Johnson and Dmitri Young: Doctors feel NJ will be healthy come spring and will be 100% ready to take the field. Dmitri is on a mission to fight diabetes. You are going to see a ready to play and proud man. One who can play to his potential. Same for Nick Johnson. Ross Detwiler made some adjustments and has done extremely well. Looks more like the pitcher he was in College at Missouri State. Randy St.Claire has personally worked with him. Adam Carr and Zech Zinicola have done well in Arizona. Both have also made some adjustments and look to compete for roles next spring in Viera. Corey Van Allen is pitching in the Futures Game Friday Night. Bill Rhinehart and Ian Desmond still have futures in Washington. Leonard Davis was moved to AAA so he would see pitches other than fastballs. And proved he has the ability. Best Quote Of The Program from Bob Boone: All players usually have basically the same talents and abilities. The Difference: Youngsters have the ability but can’t repeat it on a consistent basis. That’s the difference between talents on The Major League Level and The Minors. When they start to repeat that success then they realize their potential and become quality players. During his time on the air, Charlie Slowes mentioned that in his home in the Tampa Area for years and years, all of his neighbors parents wore the baseball caps of the teams of their youth--Yankees, Cardinals, Red Sox, etc. And their kids wouldn't support The Rays because they were so terrible. Now--everyone is wearing Rays Caps and tickets are being sold for astronomical prices. Charlie also mentioned how Tampa Bay completely changed the makeup of their team to reach The World Series. The Rays now based on speed and pitching, less power. Jim Bowden completely agreed with him. Difficult Year for adjustments for many of us. Chad Cordero being lost early hurt the entire staff. Steven Shell, Marco Estrada and I switched from Starters to Relievers. We had to get use to a new situation. As a starter, I was nibbling on the corners. In the bullpen, I just threw out the pitch count and got a little extra mph on my fastball. I like the pressure on me and the adrenaline rush of being out there. That pretty much sums up the 45 minutes of Nationals Insider which I heard. If you heard more than I paraphrased, please chime in. Interestingly, throughout the entire program, Byron Kerr kept giving a toll free number to call for fans to ask questions. No one called, not a single person while I was listening. Maybe it would have helped if Our Washington Nationals had sent out an Email to ALL SEASON TICKET HOLDERS--to let them know about the program. Even I didn't know about it, if not for a friend letting me know. Since Washington was pitching Season Ticket Sales for 2009, maybe they could have promoted this event a little more. I made the effort to listen, although finding out at the last second. I am sure many others would have tuned in to the program as well--if they knew about the airing. The Entire Broadcast could also be heard on the 1500AM Website Live. Not sure if this program will be repeated. Cancer is not a funny matter. Sohna and I only wish the fullest of recoveries for Our General Manager Jim Bowden. Over the past few months some rumors have surfaced concerning possible uniform changes for Our Washington Nationals in 2009. Additions and Subtractions were mentioned this past August during Our Conversation With Stan Kasten, although nothing was confirmed. Yesterday, I was able to follow up on this matter and received an update from a Majestic Representative. As you may know, Majestic is The Official Uniform Supplier of Major League Baseball. There will be Five Separate Uniform Tops for 2009. Two of which will reportedly remain the same as previous seasons. The Blue Curly "W" Batting Practice Jersey is back for a third season--along with the BP Curly "W" Batting Practice Cap. The Home White "Nationals" with Gold Trim and Red Curly "W" Cap is back for a 5th Season. The Red "DC" Alternate Jersey is Retired, so will it's matching "DC" Red Cap. In it's place will be a Red Curly "W" Alternate Jersey. Now the big change, something I did not expect, but my source tells me is true. The Gray "Washington" Away Jersey from Years 2005 to 2008 is Retired. In it's place will be a Gray "Washington" Script Away Jersey. A capitalized Curly "W" with "ashington" in lower case script. This design is similar to The Washington "Senators" of the Mid to Late 1960's and Early 70's. The script will also contain a swooshing line extending from "N" in the last word of "Washington" and back under the entire City Name. Interesting note--The Gold Trim is reportedly GONE from this particular Script "Washington" Jersey Front. But, no confirmation on whether the Jersey Back Numbers will have Gold Trim. Here is a picture of an Old Senators Jersey as Reference. That's Former Washington Senator Fred Valentine with his actual Authentic Senators Jersey from his playing days in the late 60's in DC. 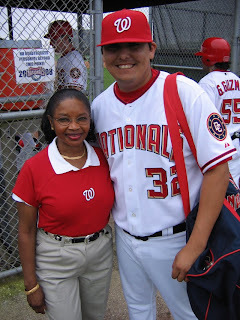 This picture taken at a 2007 Kids Clinic at RFK Stadium. Finally, for special occasions, a Blue "DC" Jersey with Patriotic Red/White & Blue Stars & Stripes (all contained within THE "DC" Logo) will also be worn in 2009. What is not clear to me or my contact--is what Cap Washington will wear with this Special "DC" Jersey. Washington wore those special Patriotic Red/White & Blue Stars & Stripes Caps last season. But I don't think those Curly "W" Caps would go with a "DC" Jersey. Sorry, I don't have any pictures on the new items, yet. Hopefully, Our Washington Nationals will have a Fan Get Together to Show Off & Promote The 2009 Uniforms this winter--Just like MLB did when they owned Our Franchise in 2005 & 2006. In November of 2005, Modells at Springfield Mall was the place for Charlie Slowes, Gary Majewski and Jose Guillen to unveil the Red "DC" Alternate Jersey and Blue "DC" Batting Practice Jersey (Now Also Retired). A STANDING ROOM ONLY HUGE TURNOUT--I might remind you--was in attendance. It was a BIG EVENT. The excitement in the crowd was FABULOUS. Just like the January 2006 Get Together with Charlie, Dave Jageler, Guillen, Ryan Zimmerman, Brian Schneider, Bryan Watson and Tony Beasley at Champps Restaurant in Pentagon City. That seems like EONS Ago. But I remember both of these events fondly. Fans were really, really excited and WANTED TO BE THERE. So did Our Players. And it's worth stating again, Guillen and Schneider were terrific at posting up for Public Team Events, seemingly every single one of them. I miss both them as Washington Players for that alone. Anyway, if I find out more info on the uniforms and caps, I will pass it along. I did ask about the Blue "Nationals" Away Cool Base Jacket and whether that might change with the Away Uniform. The Majestic Rep did not know of any differences at this time. Hope that information is helpful. PS--As I have stated before, I love The Curly "W" Logo, but I also have a heart for The "DC" Logo. 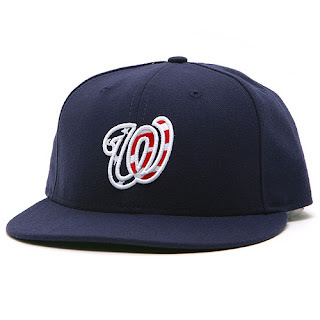 When Our Washington Nationals played their Inaugural Season, do you remember the Frenzy over the "DC" Batting Practice Hat? 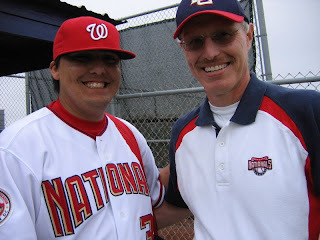 That cap and the "DC" Patch with Washington Nationals surrounding it (both worn in 2005) are still favorites of mine. 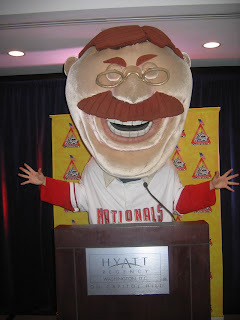 Personally, I hope Our Washington Nationals DO NOT completely faze out "DC". Those two letters should always be an important part of Our History. Was there anyone left at Fenway Park, or throughout most of America watching on television tonight, who had not all but buried The Boston Red Sox while putting The Tampa Bay Rays in The 2008 World Series? The Rays were solidly up 7-0 with just nine outs to go--and couldn't close the door on their very first American League Pennant. What a comeback by The Red Sox!! What a collapse by The Rays!! As much as I want Tampa Bay to win--you have to give Boston HUGE CREDIT and you also have to worry about The Rays. Carrying such a big lead--late--in a Championship Clinching Game--you just can't lose that lead, and that game, in a such a devastating way. Boston's dramatic come from behind, bottom of the 9th 8-7 Win is a Momentum Changer--even if both teams must now head back to St. Petersburg for Game Six. Opportunity was lost by The Tampa Bay Rays and The Nearly Pronounced Dead Boston Red Sox now live to play another day in 2008. Baseball once again showing tonight why it's The Greatest Game. You never know what's going to happen and you should never leave early. What an amazing final three innings. Incredible Turnaround. One that needs to be savored for its magnitude. If Boston comes back to take This Series--Baseball Lore was written tonight. Unbelievable really. A Tremendous Game. PS--When Boston came back to tie and eventually score the winning runs, the TV Pictures of Fans jumping up and down High Above from The Green Monster Seats and Right Field Roof Pavilion had to make you wonder whether someone was going to fall off in joy. The Celebration was wild and understandably out of control. That sight was even better than The Red Sox Dancing on the field. Good Television because the scene playing out was one of those unexpected thrills. A Moment In Time to Relish. Great Stuff. Our Washington Nationals sent out a press release late this afternoon stating three moves were made affecting the 40 Man Roster. Outfielder Ryan Langerhans and Pitcher Lavale Speigner cleared waivers and were outrighted to AAA Syracuse. But in another to move a player to The Minor Leagues--Washington lost out. Pitcher Charlie Manning was claimed off waivers by The St.Louis Cardinals. 36 Players are currently on Washington's 40 Man Roster. The Washington Nationals today announced that outfielder Ryan Langerhans and right-handed pitcher Lavale Speigner cleared waivers and were outrighted to Syracuse of the Triple-A International League. The Nationals also announced that left-handed pitcher Charlie Manning was claimed off waivers by the St. Louis Cardinals. Nationals Senior Vice President and General Manager Jim Bowden made these announcements. The Nationals now have 36 players on their 40-man roster, not including five players on the 60-Day Disabled List. Langerhans, 28, batted .234 with three home runs and 12 RBI in 73 games with Washington this season, and hit .310 with three home runs and 31 RBI in 62 games with Triple-A Columbus. Speigner, 28, appeared in seven games with the Nationals, going 0-1 with an 11.25 ERA, and went 4-0 with a 1.82 ERA in a combined 35 games (one start) with Columbus and Double-A Harrisburg. Manning, 29, had a 1-3 record with a 5.14 ERA in 57 relief outings with the Nationals, after beginning the season with Columbus where he had six saves and a 1.95 ERA in 19 appearances. Looking through emails tonight (still on the campaign beat), Our Washington Nationals sent out a team press release announcing Dr. Benjamin Shaffer, Washington's Medical Director and Team Orthopedist has resigned. Interestingly, Dr. Shaffer is just beginning his 10th Season with The Washington Capitals as Head Physician. Not much of a surprise to me, this decision, considering the delays that have taken place over the past few seasons in quickly determining injuries for Our Players. Team President Stan Kasten told Sohna and I in late August that he was concerned about this ongoing issue, as well, and would be asking the same questions this off season. Obviously, some answers were found and a determination was made by Our Washington Nationals. Curious to see what the next step might be? Washington has already fired their Strength and Conditioning Coach. Have Our Trainers past the muster? By the way--sorry for the delay is posts of late--Presidential Campaign Trail, Financial Crisis, World Bank & IMF Joint Meetings and Canadian Election (Canada is choosing their Prime Minister today--October 14th). Honestly, there has just been little free time for us. PS--GO RAYS!! They are becoming THE BEST STORY IN AMERICAN SPORT. We received a phone call late this afternoon from The Highest Reaches of The Philadelphia Phillies. Their Front Office was calling to express their concern and horror over Our Incidents at Citizens Bank Park on September 27th. 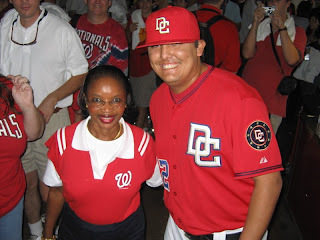 As promised, The African Queen and I had expressed our pointed opinions, in writing, about our treatment from their Fans that NL East Clinching Day for The Phillies, as well as CBP Security and The Philadelphia Police. Point By Point, we spelled out that saturday afternoon in a letter to the team. The Philadelphia Phillies called in response, first to apologize, but also to state they are taking these incidents seriously. In fact, they were "Horrified" over what happened to us. And their efforts will not stop with that phone call. The Phillies Front Office wanted to let us know that an investigation has been opened and is currently underway. Top Management is directly involved. They will be back in touch with us soon. Just wanted everyone to know that All Is Not Quiet On The National League Eastern Front.